One of the parables of Christ was about two men praying in the temple, one of them a Pharisee, the other a tax collector. The Pharisee stood and prayed about himself, while the tax collector stood at a corner, looked down and beat himself as he prayed for mercy for his sins. The tax collector’s prayer is likely the very first semblance of the Sinner’s Prayer that we often talk about today. In this study, we will compare these two men, their behaviour and their prayers in order to find out why is it that the tax collector was justified before God, and not the Pharisee. Yet I do not doubt that whatever this Pharisee prayed of was true. It was very likely true. As most Pharisees were at that time, they kept themselves free from what society commonly perceived as crimes and kept a very religiously disciplined life in respect to the laws. And if what he prayed about was true, then is there anything bad about it? Was it wrong? Was it wrong to thank God for their discipline? Was it wrong to thank God for overcoming temptation? Was it wrong to thank God for scoring a victory on his Kingdom’s behalf? I don’t think giving thanks to God is wrong – I believe that we ought to give thanks in all circumstances. But perhaps the fault of the Pharisee here was that, while he gave thanks, he did not give glory to God. His objective in his prayer was merely self-praise by pointing out to himself (and to God) that there were many weaker than he was. Standing at a distance, refusing to look up to heaven and beating his breast – these were intentional actions done to indicate his shame and unworthiness. We do not know what in particular this tax collector has done, but just as ‘Pharisees’ have a certain stereotype to them; tax collectors have too. Generally known to be tough and greedy, they are largely synonymous with sinners in the Bible – tax collectors and sinners were often addressed together. Analysis – Are we the Pharisee or the Tax Collector? For our own sake I hope we are neither. Or should I say, I hope we are both – that we are able to exercise spiritual discipline like the Pharisee; and yet pray like how the tax collector prays. Sometimes it’s easy to pray like the Pharisee did. It’s not hard. It doesn’t take a lot to look around and see all these bunch of Sunday-Christians or people who claim to be Christians yet fail to live out any Christ-like characteristics at all. Sometimes we even wish they don’t go around telling people they are Christians because they spoil the good name of Christ. Sometimes we look at them and we shake our heads and remind ourselves that we shouldn’t be like them. Sometimes we look at them and we shake our heads and we pray to God – thank God we’re not like them! It’s not that hard to pray as the Pharisee prays. At first glance, it doesn’t seem wrong at all. It is perhaps not even wrong at all. Except who are we to look at others? Are we all that righteous? Are we certain that we’re all that justified in front of God? Are we giving the glory to God? Jesus never commented on what happened to these two characters. Did the tax collector go back to his ill-disciplined spiritual life after making a prayer like that? Or did he change and strive to live out a christ-like life, even if he would probably still lack in that department when compared to the Pharisee. If it is the latter, then his prayer, though justified in front of God, was probably meaningless, no? Humbling yourself before God is one thing, but that’s not all there is to this faith. Today the prayer made by the tax collector is commonly known as the Sinner’s Prayer. Depending on what denomination you’re from, it may vary a little, but most people probably are asked to say the Sinners’ Prayer when they’ve decided to accept Christ as Lord. And what is the Sinners’ Prayer about? It’s basically confessing that I am a sinner, and Christ is my Lord. I’m a second generation Christian, and while I’ve made the Sinners’ Prayer a number of times over my years as a young Christian, I never had that significant moment in life when I made the Sinners’ Prayer and I recognised the change in me from a non-Christian to a Christian. But for people who had that experience, do you just make the Sinners’ Prayer and life goes back to normal? Or would you at least try to learn more about God, learn more about christianity, learn more about this faith, and learn more about how you can live out a christ-like life? Do not let your spiritual stability lead to pride. 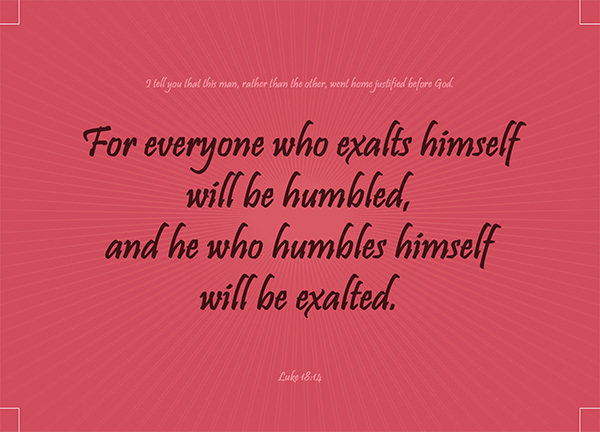 God resists the proud and exalts the humble. There’s a good reason for that. Jesus told this parable for those who were confident of their own righteousness and looked down on everyone else [Luke 18:9]. Some of us are very explicitly and intentionally looking down on everyone else – that’s called self-righteous and arrogant. But most of us aren’t – not that we aren’t self-righteous or arrogant, but that we do not explicitly or intentionally do it. We do not realise we are looking down on others. We do not realise that we’ve begun to pride ourselves on our spiritual stability. Maybe it’s time to say the Sinners’ Prayer again. Even if you are a christian, sometimes it takes a bit of reminding to remember that we’re all equal in sin.